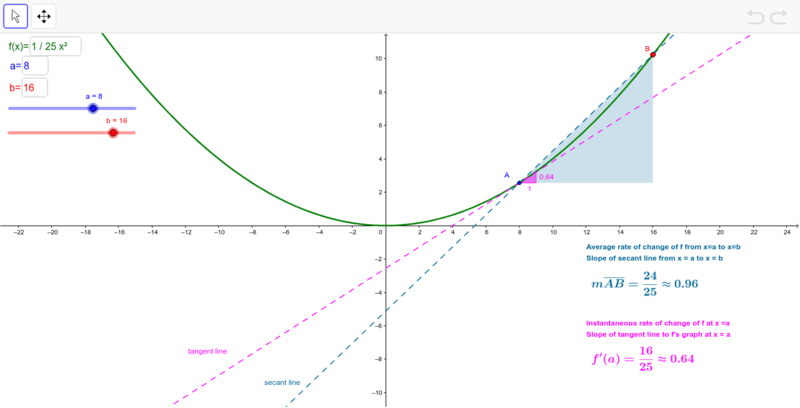 The following applet was designed to help you see the geometric interpretation of the average rate of change of a function f (from x = a to x = b) compared with the instantaneous rate of change of this same function f (at x = a). Interact with the applet below. Then answer the questions that follow. FYI: You can change the x-coordinates of points A & B by moving the sliders or by inputting values yourself in the input boxes. You can type in a new function to analyze in the green input box as well.